Moto3 and Moto2 : Misano – Go big or go home – big performances from Bastianini and Zarco bring wins. Misano was the scene of some big performances across the classes. Moto3 was still a close last lap scrap, but one which led to an Enea Bastianini win to keep the title alive as Danny Kent received an in-race penalty. Moto2 saw Zarco place himself well to benefit from an early crash from the leaders before pulling out a classy performance and enough of a lead to bag another win and edge closer to his title hopes becoming a reality. Moto3 had a fierce bunch of six riders in contention for much of the race with standout performances amongst the action for Bastianini leading from pole and Miguel Oliveira doing much of the front-running. The pair pulled away slightly as the final lap dash began, Red Bull Ajo rider Oliveira looked confident leading at the start on his new KTM frame but on the back straight a perfectly timed move let home rider Bastianini through. The Gresini rider held firm for a career first win. The pair were joined on the podium by Ongetta-Rivacold’s Niccolo Antonelli, his third rostrum finish in as many races. Romano Fenati was the best of the rest, standing out with his unusual lines through the corners and very much in contention for Sky Racing VR46 as he reeled back in the leaders as the final lap unfolded. Fifth went to the second Red Bull KTM Ajo bike over the line, Brad Binder, with a dramatic day ending in sixth for Britain’s Danny Kent. The Leopard rider was running on the back of the lead pack but had to drop a place under Race Direction’s orders after a series of laps where he had exceeded the track limits. His title lead is now down to 55 points after Bastianini’s victory, which the Italian celebrated by getting a patriotic flag style paint job in his hair trackside. Alexis Masbou finished seventh and was the best of the SaxoPrint-RTG riders with John McPhee racing further back for 19th. The first Mahindra to take the flag on race day was eighth place Francesco Bagnaia, who got the better of Isaac Vinales in ninth for RBA Racing and Philipp Oettl who put in another great effort for a top ten finish for Schedl GP Racing. Lorenzo Dalla Porta was again strong after just a handful of races since joining Husqvarna Factory Lagisse in eleventh while Livio Loi took the flag in twelfth for RW Racing. The remaining points went to Andrea Migno (Sky Racing VR46) in 13th, Stefano Manzi (San Carlo Team Italia) with a new best finish of 14th and Jorge Martin who collected the final point on offer despite a grid deduction after qualifying and a clash with his Mapfre Team Mahindra team-mate Juanfran Guevara on the last lap. Moto2 began with an elbows-at-dawn battle between pole man Johann Zarco and a resurgent, on form Dominique Aegerter, the exciting action ending all too abruptly when an over-reaching Alex Rins took a lunge under Aegerter’s Technomag bike and took the Swiss rider out with him. Zarco took full advantage and broke away at the front pushing his Ajo Motorsport bike to an almost four second lead by the race close. He also became the first French rider to take six races in one season and increased his points lead to an impressive 93 over Tito Rabat. It was Rabat who pushed hard for the second podium spot after falling behind in the early laps he wrestled his EG 0,0 Marc VDS bike to the limit and edged his way aggressively up to second by the race end. The final rostrum spot went to a emotional Taka Nakagami, back on the podium for the first time since Misano 2013, he dedicated his performance to Shoya Tomizawa. Simone Corsi rode his Forward Racing bike with confidence all weekend on his way to fourth in a very broken up field of riders. Julian Simon was a way back in fifth for QMMF and the best placed Speed Up rider. Sixth over the finish was Jonas Folger of AGR Team who set some record laps before fading from contention, seventh went to the injured Lorenzo Baldassarri on the second Forward entry. 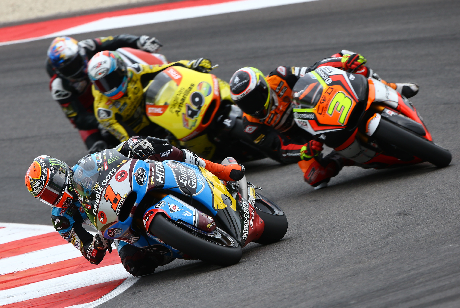 Sandro Cortese secured eighth for Dynavlot Intact GP holding off Luis Salom who finished as the top Paginas Amarillas rider after Rins crashed out and later received a black flag. Tom Luthi was the only one of the Swiss Interwetten team to finish and took the chequered flag tenth. Both had some hard practice crashes but Xavier Simeon (Gresini) and Axel Pons (AGR Team) finished when it counted in eleventh and twelfth respectively. Azlan Shah (Idemitsu Honda Team Asia) took 13th , Randy Krummenacher (JIR Racing) 14thand Ant West collected the final point for QMMF, before later revealing the team had dropped him immediately after. The wild card riders performed well with old hand Mattia Pasini 16th and Valentino Rossi’s half brother Luca Marini 21st.